Hunting a black hole. Observations of the light from star indicate that it is pan of a binary (two- star) system. This visible star has orbital speed . I. The two stars are in circular orbits. not about each other, but about the center of mass of this two-star system. 2. 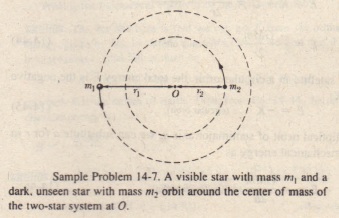 As with the two-particle systems of , the center of mass of the two-star system must lie along a line connecting the centers of the stars-that is. at point 0 in . 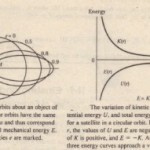 The visible star orbits at radius the dark star at radius. 3. The center of mass of the system is not even approximately at the center of a central. massive object (like the Sun). 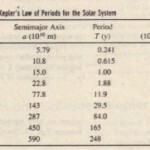 Therefore, Kepler’s law of periods, , does not apply here and we cannot easily find mass m2 with it. 4. The centripetal force causing each star to move in a circle is the gravitational force due to the other star. The magnitude of the force is , where I’ is the distance between the centers of the stars. We can solve this cubic equation for m2 with a polynomial solver on a calculator. Instead, since we are working with proximate masses anyway, we can substitute integer multiples of M, for m2 until we find one that makes nearly true. Thus, we can detect the presence of a black hole provided it is part of a binary system with a visible star whose mass, orbital speed. and orbital period can be measured.